Veni, Vidi, Blogi: I Came, I Saw, I Blogged: Ramadan Cake Pops. This is the first year that Inara has noticed the start of Ramadan. In days of yore (as in, last year and previous), we get halfway through Ramadan when Inara finally clues in to what is going on. You can't really fault her for this because her mother is the type of person who will furiously try to push a door open for five minutes straight before realizing that the sign says PULL. Also, the best part of Ramadan for a kid is the end - no seriously, it is. If you're not starving yourself all day (and Inara isn't), then nothing is really different and the whole month just becomes one big long lead up to EID. Eid, which is a huge celebration at our house involving grandparents and presents and new clothes and gorging on delicious food. Eid is basically every child's carnival funhouse fantasy on steroids. This year has been different - Inara is growing up, and she has a remarkably strong sense of her own identity at the ripe old age of five. This is something I find very curious, because unlike my daughter, I'm thirty...something and still trying to figure out who I am. Inara however (and I suspect Nissa as well, although it's a little too early to call) are little people with HUGE convictions. Once these two have decided on something - there is NO TURNING BACK. We've always let everyone in our house decide for themselves about faith and spirituality. 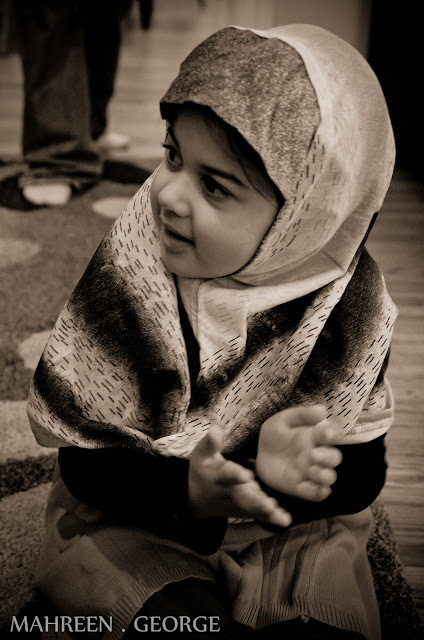 We tell our children what the beliefs of Islam are, and then we all decide - together - about how to best go about incorporating those beliefs in our lives. We also talk about how Islam is a lot like other religions and belief systems in the world, and how it's okay to believe any number of things...or nothing at all. We do this consciously because we truly believe that these open discussions are going to be the only way that we can help cultivate acceptance, and love, of our fellow human beings. Me: Inara, are you excited about Ramadan Eve? Inara: Umm, YEAH Mama! Of course I am! Me: I'm excited too! What are you excited about the most? Inara: I'm excted that we get to have Ramadan tomorrow for ONE WHOLE MONTH. Me: It's true! And what do you like the most about having Ramadan for one whole month? Inara: Come ON, Mama. You know. gigglegigglegiggle. Me: (I actually have no idea what she is talking about at this point) Oh sure I know. But I just want to make sure that we know the same thing. Does that make sense? Inara: Yeah, I guess. I'll tell you what I am the most excited about and then you can say, ME TOO! Me: Or not. I could maybe not say that, right? It kind of depends on what you're so excited about. Inara (wailing): But you HAVE TO SAY ME TOO! Otherwise I can't get excited about Ramadan! Me: Well we can't have that now, can we? Inara: No. We CAN'T. So don't say it, okay mama? Me: Why don't you just TELL ME what you're so excited about? Inara: Okay. I'm going to tell you now. I'm excited that Ramadan is a HUGE celebration. It is a celebration, right mama? Me: Well...it can be, I guess. It can be a celebration for us if that's what we want it to be. Inara: THAT IS WHAT I WANT IT TO BE. Me: Inara, can you tell me what we're going to do for this Ramadan celebration? Inara: Well of course the best part of the Ramadan celebration is the Ramadan food that we get to eat. Me: Inara. You know that part of Ramadan is fasting all day, right? That's like the opposite of food. Inara: CELEBRATION! We're talking about a celebration! Me: Right, a celebration. Go on, then. Inara: So I think that we should make our own Ramadan celebration foods. Like Ramadan waffles, and Ramadan pancakes and Ramadan cake pops (cake pops?!?) for ONE WHOLE MONTH! Me: Cake pops? I don't even know how to make a cake pop, Inara. Inara (very seriously): Well then you should really find out, Mama. Because cake pops are like a part of Ramadan. You can't have Ramadan without them, okay? Ramadan cake pops, people. CAKE POPS. Not the fasting, not the sacrifice, not the empathy for others who are less fortunate than us. Just...cake pops. I can just imagine how it went down, too. All this time that we've been spending together, reading stories about Ramadan and discussing what it means to us...all the time I've spent talking to her about the things that matter, Inara has been thinking CAKE POPS CAKE POPS CAKE POPS. We are a family that apparently believes in cake pops. Meh. I guess things could be worse. Ramadan Mubarak, friends! May your month be filled with love, peace and many cake pops. Guess what she's praying for?